We are proud to be the only Podiatry office in Lorain County to provide in-office treatment using 2 different lasers for the removal of warts on the hands and feet. Patients from all over Northeast Ohio are referred to our office from dermatology offices and other physician offices because of the specialized laser treatment we offer. The Pulsed Dye Laser is the most advanced treatment available for treating warts, allowing patients to return to normal activity immediately. There is no wound created, and the wart is destroyed slowly which allows for little to no disruption in your day to day activities. 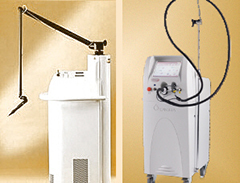 The Carbon Dioxide Laser is the quickest treatment available for warts on the hands and feet, eliminating the wart in one treatment.